Organised by the Institute of Education [IOE] Islamic Society with support from Islamic Circles, Nida Trust & the Pickthall Academy. Professor Alparslan Acikgenc received his B.A. degree at Ankara University, School of Theology in 1974. He was successful at a nationwide exam and then was awarded a scholarship abroad to do MA in University of Wisconsin-Milwaukee and PhD in History of Philosophy and a student of the late renowned Islamic scholar, Professor Fazlur Rahman of University of Chicago. His research interests include epistemology, History of Philosophy, Islamic Philosophy and Philosophy of Science and some his publications include Islamic science, “The Emergence of Scientific Tradition in Islam”, “Ibn Rushd, Kant and Transcendent Rationality: A Critical Synthesis” amongst many. 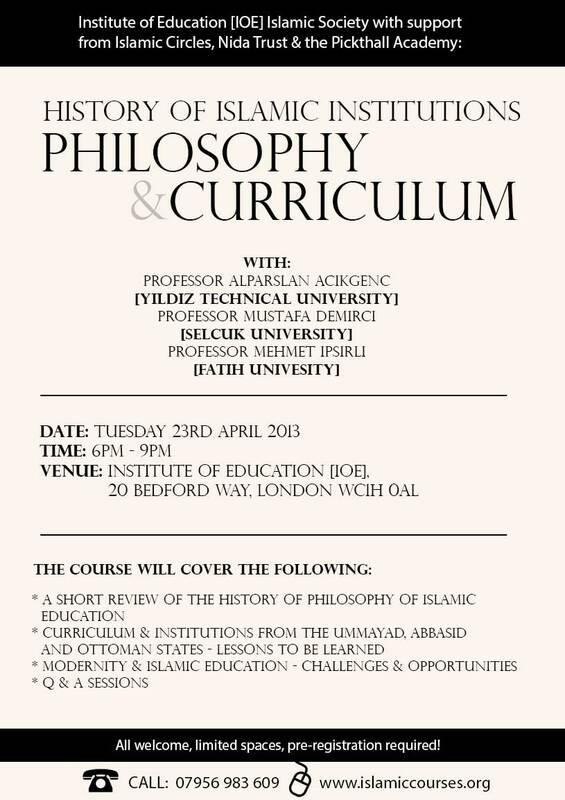 He has taught has various universities in various countries such as the International Institute of Islamic Thought and Civilization (ISTAC), Kuala Lumpur, Malaysia, University of Jordan, and currently Professor of Philosophy and Head of The Social Sciences Institute at the Yildiz University in Istanbul. Professor Mustafa Demirci, studied Islamic Sciences at the Karaman Imam Hatip school, Karaman, Turkey, and then pursued higher studies at the Selcuk University Faculty of Theology and completeting his PhD at the Marmara University Institute of Social Sciences. His research of interests include Islamic History and Civilization, Institutions in the Muslim world and studying knowledge forms in Islamicate societies of the various dynasties. As a polyglot, he speaks and teaches in multiple languages such as Arabic, English and French and has taught at various institutions such as the University of Yüzüncüyıl, University of Jordan and currently a faculty member at the history department of the University of Selcuk. Professor Mehmet Ipsirli completed his BA in History from Istanbul University and then went on to completed his Masters and Doctorate from the University of Edinburgh. As a leading Ottoman Scholar, he has taught Ottoman History for the last 35 years and is his research expertise includes Ottoman Administrative and Institutional History, Ottoman Historiography, Ulema in Ottoman Learning System and contributed to many academics journals, publications and conferences. He is a member of the Turkish Historical Society (Türk Tarih Kurumu) and currently he is Professor of Ottoman History at the Fatih University in Istanbul.